Now lets talk about pores... Every one must have experienced with blackheads and whiteheads problems. before, right? Pore problems are usually caused by junks or dirt or makeup residue that resides on skin which clogs our pores and results in these endless pore problems. In series cases it can cause break outs which will be totally uncool. From my own personal experience due to my severe break out experience in my teens I do have huge pores on my cheek area and some on my nose. Although the acne has cleared up but the pores aren't shrinking back to its actual size which makes it even easier for my pores to clog as their size are bigger. That's why cleansing is essential in my skin care regime, I try my best not to skip cleansing step everyday. Not only acne but pore problems can also cause blackheads and whiteheads that can be troublesome too on the skin. You know with all those heads sitting on your skin it'll be very difficult for your skin to look flawless. Especially as someone who loves natural looking makeup, I need to ensure my skin condition is prominent so that I don't need to layer up tons of base makeup... However the truth is my skin isn't perfect either :'( I experience break out every now and then and I do have blackheads that are very difficult to get rid off. Usually when I'm kinda bored I would pick on those blackheads trying to pull them out but sometimes when I don't succeed I'm actually causing more harm to my own skin and eventually it turned to active acne!! That's why never ever pick on your acne or touch your face... because most of the case we're only doing harm to our skin by adding more germs and bacteria to our skin from our hands. So now I'll be introducing you to this brand called B.Liv, years back this brand was kind of booming here in Indonesia.. Promoting about their Off with those heads (blackheads sebum gel) which was said to be effective to battle and enables us to extract blackheads easily. However I was always kind of hesitant to try new skin care because my skin is super sensitive but last month when the representative of B.Liv contacted me to do a review about their products I was also still hesitant whether or not to take it. But after some discussions and the reassurance from the B.Liv Team which are so kind to answer to all my queries I decided to give it a go. It because I really want to try their Off with those heads (blackheads sebum gel) and see whether it actually works to fight blackheads. Does it really work? make sure you read till the end. This gel helps to unclog pores and lessen the occurrence of black and whiteheads. It also helps to remove blackheads and whiteheads without any painful extraction process. It also helps to control the secretion of oil thus making your skin looks a lot clearer. It is suitable for all skin type with blackheads and whiteheads. the gel itself doesn't have any significant scent and it absorbs quickly onto the skin. it doesn't leave any greasy film on top of the skin. after giving this product a good try for a couple weeks now i realize that it really helps to get rid of blackheads and whiteheads that are usually very difficult and painful to get rid off even with forceful and painful extraction process but now they comes off very easily!! now my nose area has become a lot clearer with the removal of blackheads. - Pump 2 to 3 pea sized drops onto your palm then apply on your t-zone areas and on the areas with black and whiteheads. 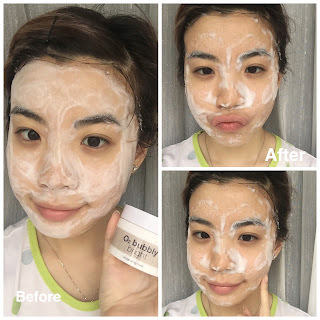 This O2 bubbly bright (Oxygenating mask) is said to be purifying, brightening and exfoliating.Its formula combines oxygen bubble and rice powder to brighten up and even up complexion, the red soft beads gently exfoliate the skin while the frizzes starting forming bubbles in soft foam to soak up impurities on the skin. Using a sufficient amount of product all over the face I spread the product evenly on my skin and then it'll start forming bubbles in which by 10 mins your whole face will be covered with bubbles, as shown in the picture below. After rinsing it off my skin feels super fresh, supple, soft and it doesn't feel like its stripping off all the moisture. No squeaky/ tight clean feeling too! This is how the product looks like on the inside, it comes in a pinkish formula with tiny red exfoliating beads that are very gentle on the skin. The formula really feel like it deep cleanse yet very gentle on the skin too. One the left its the picture of my face with the product right after application, the product starts to foam up and create bubble on the skin. Then after leaving it for 10 mins the bubble disperse and become more dense in some area. Then I would usually massage the the bubbles into my skin again before rinsing off.